Wrestler Mark Schultz forms a relationship with his new sponsor, millionaire John du Pont, as they train for the 1988 games in Seoul - a union that leads to unlikely circumstances as both men feel inferior to Mark's revered brother, Dave. 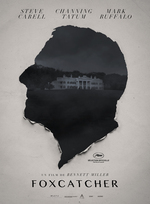 Despite its hefty 134-minute running time, “Foxcatcher” doesn’t have an ounce of the proverbial narrative fat: If the screenplay, by Dan Futterman (“Capote”) and E. Max Frye, is relatively spare in terms of dialogue, it’s satisfyingly rich and thorny in its conception of the tightly wound triangle at its center, while Miller’s direction evinces the same sustained intensity and consummate control of his material that defined his first two features. According to Wikipedia, Foxcatcher will receive a limited release on November 14, 2014. I had no idea what this movie was about, and had never heard of the true story it's based on. If that's you, I definitely recommend going in as blind as possible. That's not too say advance knowledge of the story/events makes the experience worse or better, just very different in this case. This looks like a very dark, very intense movie. I do want to see Steve Carell's performance, though. I saw Carell being interviewed on The Daily Show and they carefully avoided discussing what the movie was about - I thought maybe it was sexual exploitation/harassment? Had no idea of the background. So it led to this post. Would love to hear what people thought of this film, and the actors who played the two brothers, in addition to Carell's (much-praised) performance. I remembered enough of the original incident as a news story that spoilers aren't really the point here, and The Dissolve's review [spoilers!] says "This is a true-crime story in which the crime is treated as an afterthought." What it does have to say takes the entire movie to say, and "The film proceeds like a well-constructed argument." For that matter, the Times has a capsule video review that is spoiler-free. Speaking in anticipation, it's not something you would have expected from Carell in his Daily Show days, but I do believe that his Michael Scott character was much less of a sitcom caricature than people may think, and was informed with an essential pathos (and it was character depth that led the series to its IMO high point, "Dinner Party" [avclub]). Given some of his movie work he's also edged into dramatic territory, going beyond a nebbish with clipped speech patterns, most notably with last year's The Way Way Back (which was charming but flawed and, I believe, limited by the narrative abilities of the Faxon/Rash screenwriting/directing team). Still, part of his ability as an actor is playing people who fail to connect in fundamental ways, and that probably makes him a really good choice here. This still looks like it could be a mesmerizing performance (I've looked at clips). Mark Ruffalo is of course an immensely talented actor (and is here working in a physical appearance much unlike his own natural presentation, which he nevertheless brings to most of his work). For all his attention to behavioral detail and excelling in two-handed scenes (Julianne Moore in The Kids Are All Right, Laura Linney in You Can Count on Me), he has always brought an aggressive physicality to his roles. Channing Tatum may seem, again, a bit of a stretch for the material, but I've seen enough of his work to know that there's a real actor behind the jock's mug. It looks like everyone is at the top of their game with this one. I saw Carell being interviewed on The Daily Show and they carefully avoided discussing what the movie was about - I thought maybe it was sexual exploitation/harassment? I saw a prerelease screening last week and that was the impression I had had going in as well, but [and this is not really spoilery but just as a caution beware] the dynamic the film presented is not so much one of sexual exploitation, which was at best implied, but more like du Pont treating the Schultzes--particularly Mark--as pets. (There was one moment when a friend and I simultaneously exlaimed "Good doggie!" as Tatum did something for Carell--you'll know it when you see it.) What I came away from it thinking is that the rich really are not like you and me. Plus it examines what being "idle rich" really means and the restlessness & chafing it can lead to. The film so affected me that I went back and looked up details of the real story and was surprised to find out that they diverge fairly heavily. I think it still works though; the movie was grasping at different things and it works, mostly. I really recommend this interview the director did with The Dissolve; it's fairly short but pretty illuminating. Can't believe Bennett Miller's first movie was The Cruise. This movie totally caught me off-guard. I was sure we'd discussed this, but I didn't realize this was all the way back in November. There were only a couple of things wrong with it, but they kind of affected my enjoyment. I really liked it, but the sense of time was off. Knowing that the murder was going to happen in 1996, I kept thinking, "Okay, so... they're still in 1988?" and then it happened and... somehow Dave was still living there after the whole arrangement with Mark leaving? Then, also, they missed the thing about how so much of wrestling has to do with control and making weight and sweating. I mean, they showed him getting rid of that crazy amount of weight before the trials, but I think that was a theme that they really could have played up before. Finally, my husband had a big problem with how suddenly they thought John was creepy and had to get away. I thought that it was fine, but he would have liked one more scene in which one brother said to the other, "Wow, John is making me uncomfortable." I thought all three leads were excellent. I've long since converted to the Church of Channing, who does great work, and Ruffalo did that thing he does so well to bring out the interplay between characters. There's a scene where his face basically turns into a sign reading "This is one crazy rich dude." Reminded both me and a friend of Behind the Candelabra. Treating people as objects so often goes wrong. Just watched this yesterday, and as the credits rolled, all I could say was, "Who cares?" I get that it's based on a true story and all that, but I didn't connect with a single one of the characters, nor did I care about any of them. I also totally didn't understand anything that the Channing Tatum character did. His motivations made no sense at all to me - why did he become such a passionate fan and friend of DuPont, and then why did he all of a sudden turn on him and begin to resent him so deeply? Maybe I missed something deeper, but none of these characters felt even remotely realistic to me.